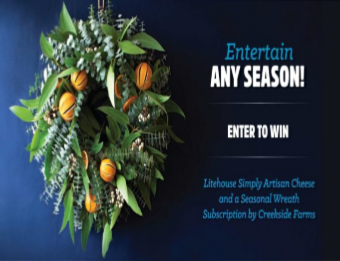 Litehouse “Entertain Any Season” Sweepstakes – Win a wreath subscription & more! Win a wreath subscription & Litehouse Simply Artisan product coupons! ELIGIBILITY – The Promotion is open only to legal residents of the United States or the District of Columbia (excluding Puerto Rico and any other U.S. territories) who are 13 years of age or older and have reached 13 years of age in their state as of November 25, 2018. SWEEPSTAKES ENTRY PERIOD – The Promotion begins at 9:00:01 a.m. Pacific Time (“PT”) on Monday, November 26, 2018 and ends at 11:59:59 p.m. PT on Friday, December 14, 2018. PRIZES – One (1) grand prize available (valued at $373.00): A wreath subscription by Creekside Farms valued at $289.00 (winner will get 4 Creekside Farms wreaths total, with the first one shipping in December 2018, and the following 3 over the next year) as well as 12 Litehouse Simply Artisan free product coupons (valued at $84.00).